Q. What is ingot trading? A. 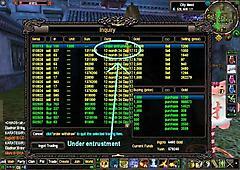 It is a trading system accessed through the NPC called Auctioneer. It let's you trade your Gold or Yuan with other players safely and efficiently. You also control the prices you want, whether you are selling or buying Gold. Q. Where is the Auctioneer? Q. Is it safe? Is the service for free? A. It is very safe since all transactions are made via the auctioneer which ensures you that your Gold and Yuan are taken care of with utmost care. Of course this special treatment and trading will cost you 2% tax per transaction. If you are selling Gold, the 2% tax is paid in Gold. If you are buying Gold, the 2% tax is paid in Yuan. Q. Wait a minute, I see something called silver? What is Silver? A. Silver is the equivalent of centavos for Gold. 1 Gold = 100 Silver which is like 1 Peso = 100 Centavos. If you sometimes sell Gold in uneven amounts, you have to pay taxes in Silver because of the 2% tax. Q. Woot! Im going to Sell Millions of Yuan and Gold in one go! Q. What if I want to sell my Gold at a higher rate or buy Gold at a lower price that what is readily available with the auctioneer? A. You can entrust your Gold or Yuan and sell them at your own price but if nobody buys/sells what you're trying to sell/buy after 3 days, the money you entrusted will expire and will be returned to you but the tax will be deducted from your original money. So it will be a risk since you could also lose money. Q. Okay, I think I'm ready for ingot trading! What cards should i buy to load Gold into my account? A. You can buy all kinds of Level Up cards including RF 500 cards, and Khan cards. After the merge of Level Up and Netgames, their cards are now universal for all the games they cater. Q. Cool! Where do i load my cards? A. You can load or top-up your cards through my level up site. Now go to the nearest auctioneer NPC and click 'Ingot Trading' as shown here in this image. Now before we do anything, let us take a moment to get to know the parts and sections of the ingot trading window. 3. 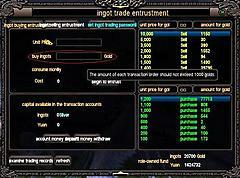 Gold Ingot Trading Account Password - password management for ingot trading safety. 4. Gold Ingot Sellers - shows the list of rates of how much Yuan is being asked per Gold ingot unit; in other words, people are selling Gold pieces at these prices and the quantity of Gold they are willing to sell. 5. Gold Ingot Buyers - shows the list of rates of how much Yuan you can exchange per Gold ingot unit; in other words, people are buying Gold pieces at these prices and the quantity of Gold they are willing to buy. 6. Buying/Selling Transaction Details - this is where you put in details like quantity of Gold you are buying or selling and the prices per unit of Gold. Note: the outcome and taxes are automatically computed for your convenience. 7. 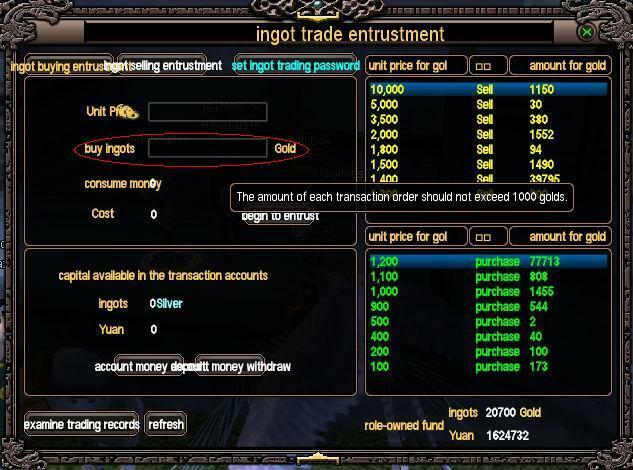 Gold Ingot Trading Capital/Account - this is where you deposit Gold and Yuan; this acts as your capital when doing Gold ingot trading transactions. 8. 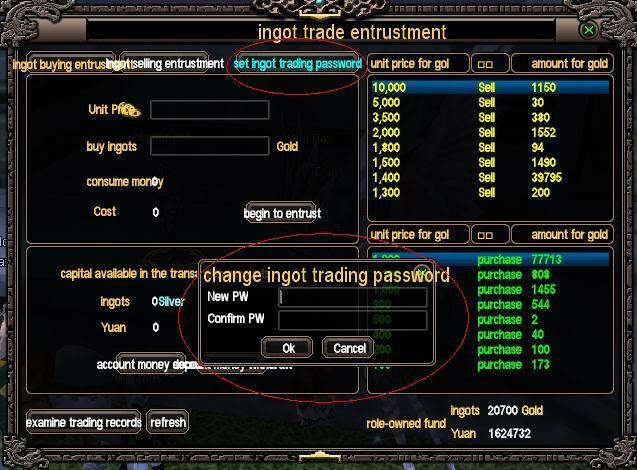 Ingot Trading Records and Refresh button - shows your ingot trading records and refresh button to refresh the window/account. all ingot trading records are saved for only 9 months; meaning all your ingot trading records are saved but will be erased in 9 months time. 9. Yuan and Gold on Hand - shows the Yuan and Gold your character has on hand; liquid assets. Now there will come a time when you want to acquire Gold in exchange for Yuan (also pronounced YEN by the way.. ). 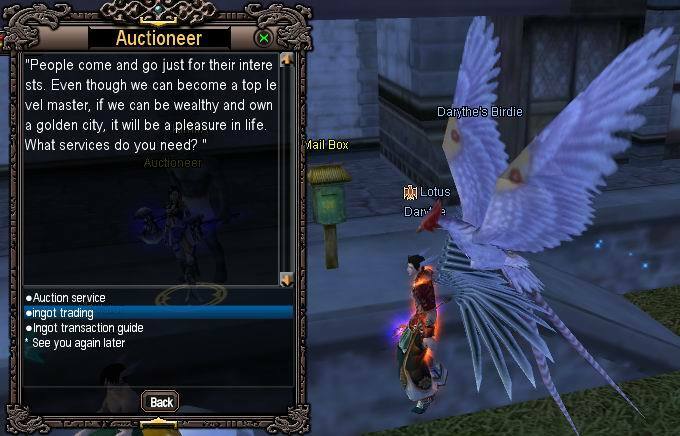 So head to the nearest Auctioneer NPC and do some ingot trading! 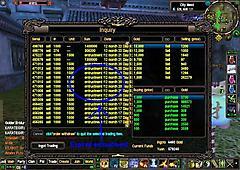 Go to the auctioneer and click ingot trading! Make sure to click 'INGOT BUYING ENTRUSTMENT.' One way to check if you did, is to look at the tax. If the Cost/Tax is not in Silver or Gold, you are on the right track! Now that you are on the right track, check the rates of the sellers of Gold to get an idea what is the normal or average buying rate of Gold. These are the rates in YELLOW in window 4. IF you see a rate that is good for you, then good since you can get the Gold right away. But if you dictate a rate/price that is not on the list, you will have to wait for the Gold to be traded when a player sells his Gold at the rate you dictated. Now here is an example of an ingot buying transaction. 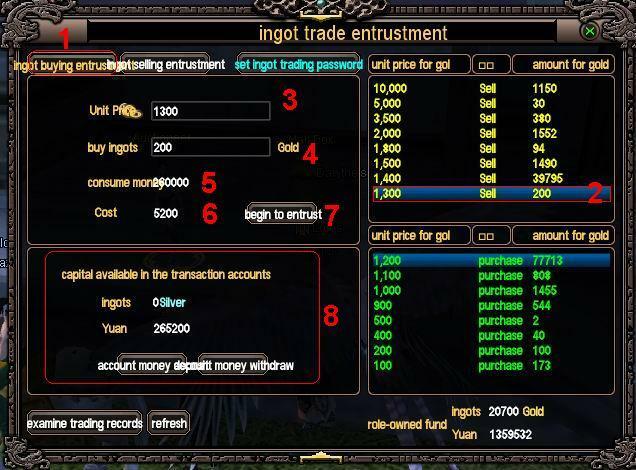 As you can see, I clicked 'ingot buying entrustment.' Then i checked the rates in YELLOW because that is the window with the rates per-unit-of-Gold being sold by other players. I highlighted the one with a rate of 1,300 Yuan per Gold piece; which is also 200 pieces of Gold is being sold at 1,300 Yuan per piece. So, i type in the price which is 1,300 in the blank (see number 3). Then i type in the quantity of Gold i am willing to buy which is 200 pieces (see number 4). Now you see that the total cost in Yuan is displayed along with the 2% tax; which is 260,000 Yuan subtotal and 2% tax of 5200 respectively [tax derived from 260,00 x 0.02 = 5200] (see numbers 5 and 6). And I deposited the grand total of 265200 in my capital. (to deposit Yuan or Gold in your capital just click 'account money deposit' in number 8). When everything is good and done, i just click on 'begin to entrust' to complete the transaction (see number 7). To check if i have received the Gold, i just click on 'refresh.' To get the transacted Gold from my capital, i just withdraw it from my capital (to withdraw Yuan or Gold in your capital just click 'account money withdrawal' in number 8). And the you have it! ingot trading is done! You now have Gold bought through Yuan via the Auctioneer NPC! Now there will also come a time when you want to acquire Yuan in exchange for Gold (also pronounced YEN by the way..). So head to the nearest Auctioneer NPC and do some ingot trading! 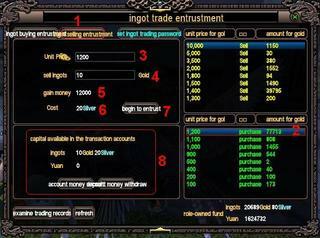 Make sure to click 'INGOT SELLING ENTRUSTMENT.' One way to check if you did, is to look at the tax. If the Cost/Tax is in Silver or Gold, you are on the right track! Now that you are on the right track, check the rates of the buyers of Gold to get an idea what is the normal or average buying rate of Gold. These are the rates in GREEN in window 5. IF you see a rate that is good for you, then good since you can get the Gold right away. But if you dictate a rate/price that is not on the list, you will have to wait for the Gold to be traded when a player buys Gold at the rate you dictated. Now here is an example of an ingot selling transaction. As you can see, I clicked 'ingot selling entrustment.' Then i checked the rates in GREEN because that is the window with the rates per-unit-of-Gold being bought by other players. I highlighted the one with a rate of 1,200 Yuan per Gold piece; which is also 77,713 pieces of Gold is being bought at 1,200 Yuan per piece. So, i type in the price which is 1,200 in the blank (see number 3). Then i type in the quantity of Gold i am willing to sell which is 1000 pieces (see number 4). Now you see that the total profit in Yuan is displayed along with the 2% tax; which is 1,200,000 Yuan subtotal and 2% tax of 20 Gold respectively [tax derived from 1000 Gold x 0.02 = 20 Gold] (see numbers 4 and 6). And I deposited the grand total of 1020 Gold in my capital. (to deposit Yuan or Gold in your capital just click 'account money deposit' in section 8). When everything is good and done, i just click on 'begin to entrust' to complete the transaction (see number 7). To check if i have received the Yuan, i just click on 'refresh.' To get the transacted Yuan from my capital, i just withdraw it from my capital (to withdraw Yuan or Gold in your capital just click 'account money withdrawal' in section 8). And the you have it! ingot trading is done! You now have Gold sold with Yuan as profit via the Auctioneer NPC! For visual purposes i have also made a diagram showing a transaction with Silver for tax.